We've all seen the impossible luxury of dedicated gaming tables. 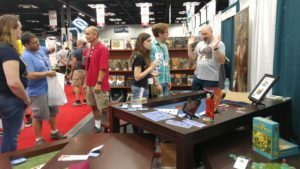 Whether we saw them in-person at a place like Gen Con, or pictures were shared to one of our online forums, we've all had a good drool session over them. They tend to be one part high-roller, and one part hardwood, and we're tempted to reach for our wallets to shell out whatever they're asking. Until, that is, we see the actual price of some of these furnishings. If you've found yourself in that predicament, I'd like to direct you to Carolina Game Tables. They've got the luxury you've been dreaming about, but at a price that won't make you sell off all your quest rewards at once. Yeah, I want one, too. So how does it work? Well, it's pretty simple. You pick the size of the table you want (though if you're going to pick Tablezilla, you'd better have a gaming room of appropriately epic proportions to match), the finish you want the table to have, and the fabric that covers the play surface. Your table will be produced by some of the finest cohorts in the land in 16 weeks, and if you live in the continental U.S., it can even be delivered straight to your door. When your normal friends and family are around, it's just a high-quality, mahogany table. When it's time to play, though, the tabletop comes off, revealing the epic arena below! Carolina Game Tables is run by Clint Black and Jodi Black, who've been involved in other parts of the tabletop gaming industry for some time. They know the ups and downs, and the pain that comes when you want to have somewhere really nice to indulge in your heroic hobby. Fortunately for all of us, they also had the idea to design high-quality gaming tables, and the business savvy (along with the business contacts) to pull it off. If you can make it at Gen Con, you can make it anywhere. With four sizes, six fabrics, and four finishes, that's a lot of combinations for your gaming table. While Carolina Game Tables doesn't do custom orders, they are planning on expanding the options they have available based on the interest from their customers. Bypassing gimmicks, it's a company that doesn't cut corners. 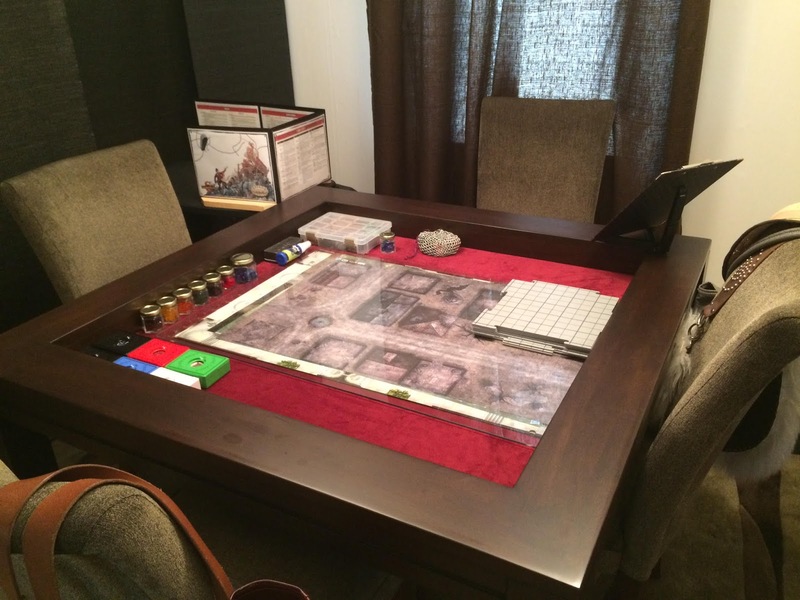 You're not just buying a gaming table. You're buying a high-quality adventure accessory that can do double duty when Thanksgiving, Christmas, and other gatherings all rear their heads as well. Seriously, go take a look at Carolina Game Tables. I have to go cajole my wallet out from under the bed. If you feel for my wallet, and would like to help me get it out of hiding, why not go to The Literary Mercenary's Patreon page to become a patron? As little as $1 a month keeps the content coming hard and fast, and gets you some free swag while you're at it! I hope you enjoyed this week's Moon Pope Monday update, and if you haven't followed me on Facebook, Tumblr, and Twitter yet, well, what's the hold up? Thanks Neal! If anyone has any questions about our tables, they can email gametableJodi@gmail.com or gametableClint@gmail.com.